The easily replaceable plastic replacement cradle you get as standard with the SP4 service pager from LRS. This cradle may look fragile, but nothing could be further than the truth. Its made of premium materials and is extremely robust. No other cradle from any other maker will fit the SP4 pager. An alternative is our pager protector leather case only from LRS UK. If you look at the cradle you have, you will find that calling the material 'plastic' is really incorrect. This pager cradle is designed to be tough, but importantly, is made from Lexan which is the strongest form of 'plastic' that can be used for the making of a cradle. The SP4 service pager cradle with clip. This cradle securely holds the pager in position. Changeable by the user and there are no 'difficult' screws or other issues that are sometimes found on compatitive products. 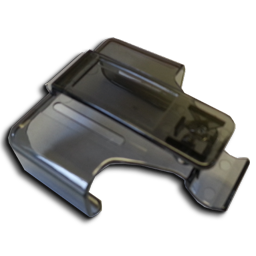 We always carry stock of these original pager clips and they can be ordered for next day delivery. Alternatively, you might wand to consider our leather protective case that can protect the pager from accidental damage. The Star pagershown here has 4 special unique leds that with the right transmitter can display many messages. Its rugged and designed for extended use. Will operate for up to 48 hours from one charge.